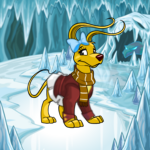 An Elderly Neopet's Guide to the Pet/Beverage Combinations You Didn't Think of! Granny's got some wisdom to impart to you young Neopians. I haven't been around all these years for nothing, alright! So, listen up! I know that many of you have all but given up on afternoon tea-time, what with your busy lives and power lunches and whatnot. However, I've been inspired by the recent popularity of the "Eat Slow!" movement. Enjoy this handy guide to eating, erm, drinking slow. You know, because coffee and tea are both hot! Ha! Who says I don't have a sense of humour? They still teaching reading in neoschool, right? Good, so then you've all read my title. Everyone knows that Faerie pets prefer to drink Faerie Tea Bowls, and that Molten pets love the steam out of Fiery Coffee, but what about the rest? Join me on an exciting count down of all the "Eat Slow!" pet/beverage combinations you've never dreamed of! Hold tight and prepare to be shocked, kiddos! Ho ho ho! It's Christmas time anytime with these festive pets! Tea time with Christmas pets can be a challenge- hot drinks can be difficult to hold onto, and it's next to impossible to get stains out of those red velvet suits. The solution? Cranberry Flavoured Borovan! Not only does the smell of warm cranberries remind even the Grarrls of Christmas, but the colour blends perfectly with those suits. Yup, this drink is spill-friendly for your Christmas pet! If your pet doesn't like cranberries, Super Spicy Borovan works as an excellent substitute. These hearty, brawny pets prefer hot drinks that remind them of their natural habitat, the woods. Clover Cream Coffee is a sweet reminder of what it is like to graze on the finest grasses and plants. There's even a clover-liscious iced version for tea time on those warm summer days! Can't afford either of these options? Authentic Tyrannian Coffee has a rich, earthy taste that is sure to satisfy! Can't find it? Try Sprout Flavoured Borovan for an almost-right substitute. If you're really desperate, Illusen Day Drink will easily remind your pet of home, though it isn't, strictly speaking, a hot beverage. Royal pets will turn their royal noses up at all but the most expensive beverages, so be ready to shell out a lot of neopoints at time tea time if you've got one! The hands-down favourite of Royal pets everywhere is Chilled Borovan with Frozen Asparagus, followed closely by Cocoa Juppie Mocha and Candy Corn Latte. These hot beverages are rare, and will cost you more than what would have been a year's salary in my day. For this reason, I recommend making tea time an annual occasion for all Royal pets. You can, of course, try giving your Royal pet some of the more expensive buyable hot beverages, such as Orange Meerca Tea, or Purple Scorchio Tea, but I can say from experience that I've never seen a Royal pet satisfied with anything that costs under 100K. Biscuit pets are some of my absolute favourites! Just look at them! Look! Those crumbly little faces, and those spots.... I could just about eat them up! Erm.... Biscuit pets are also simple folk, and easy to please, much more like Neopians were back in my day. No need for fancy, expensive drinks here, just simple Hot Tea. Try Sweet Tea or Tea With Honey and Milk for an extra treat when your Biscuit pet has been especially well behaved. Be wary, though; spills can be fatal for Biscuit pets: you may want to invest in a good quality tea-time apron. There's only one tea for snow pets: Pure Ice Tea. Handily frozen solid, this tea poses no threat to your lovable snowy pet! This tea also comes with an added tea-time bonus: because it is frozen solid, it will take your pet ages to finish, which means more time for you to tell all of your favourite stories! These spooky pets deserve a hot beverage that's spooky enough to match them! I recommend Spiked Dariberry Tea. Its tiny black cup is sophisticated looking without harming your pet's scary reputation. Decaf Darigan Coffee is an excellent alternative for those pets that need a good night's sleep after a long day of haunting. How cute! And squishy! Squiiiiiish!!! Ahem. Right. Plushie pets are absolutely adorable, and they require adorable hot drinks to keep them happy! An easy to find tea-time favourite for these fluffy, fluffy friends is Zafara Hot Chocolate. The taste of coffee is too bitter for these sweeties, but such cute teas as Hot Meerca Tea and Noil Tea will do in a pinch! Jelly coffee? Where in Neopia would that come from? No, no, you young un's, Jelly pets (a mystery unto themselves: how did they *get* that way??) like real beverages. They tend towards fruit flavoured drinks, such as Hot Papaya Tea, Grapefruit Tea, and Azzle Tea, though almost any fruity tea will do the trick with these ones! Be warned, however, NEVER give your jelly pet Pineapple Juice. Aren't they sophisticated looking? I heard a rumor that the band Jazzmosis are considering going checkered for their next album! These intelligent, artsy pets need tea-time drinks that reflect their superior taste and cultured appearance. You really must serve them a Double Shot of Expresso! Just one, or you're sure to have a very hyper pet. If you've got a pet that's already high energy, you might consider giving them a Decaf Espresso instead. Oh dear, that's me! Well, I don't expect you young folks to know very much about us Elderly folks. In fact, I don't expect you to know very much at all! Ha! Oh, I crack myself up! That said, I bet you'll never guess what our favourite tea-time beverage is? It's shocking, I promise. Ready? Go on, guess. Ha! Not even close! Make Elderly pets everywhere happy at tea-time by serving us a down-to-Neopia, good old fashioned cup of Earl Grey. There we are, folks. That's the whole, shocking story. Tune in next time for "Jelly World: If It Doesn't Exist, Why am I paying a Jelly World Tax? I'm on a fixed income, don't you know??"